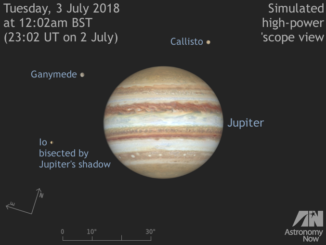 The start of July finds magnitude -2.3 Jupiter almost two months past opposition and highest in the southern sky around 30 minutes before sunset for observers in the British Isles. 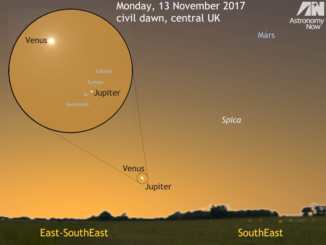 The solar system’s largest planet may be past its best, but there still plenty of Jovian events visible from the UK. Jupiter has passed opposition, but the solar system’s largest planet is still putting on a magnificent show in the southern sky at dusk. Backyard telescopes readily reveal its Great Red Spot storm feature and four main moons constantly playing tag. 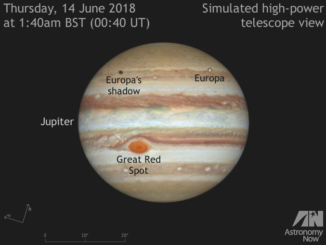 Here’s our full guide to Jovian events visible from the UK in June. 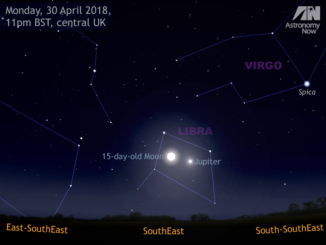 Skywatchers in Western Europe looking at the rising 13-day-old gibbous Moon in the south-southeast at dusk on Sunday, 27 May can also see prime-time Jupiter within the same binocular field of view. But look closer in the vicinity of the solar system’s largest planet and you’ll see an easily resolved double star – alpha Librae. With the opposition of Jupiter occurring on 9 May, now is the time to ensure that your telescope is clean and collimated (aligned) to deliver the sharpest images of the solar system’s largest planet at its best. 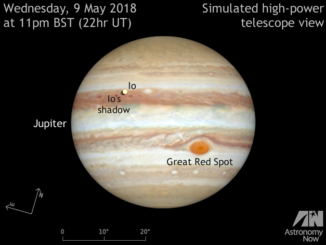 We tell you when and how to view Jupiter’s Great Red Spot and a wealth of Galilean moon phenomena throughout May 2018. 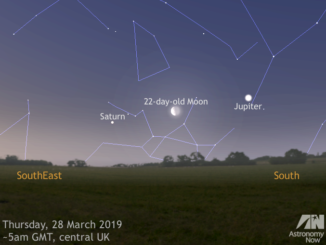 Observers in Western Europe looking at the rising full Moon low in the southeast on the night of Monday, 30 April will also see conspicuous planet Jupiter close by, the pair fitting comfortably within the field of view of typical binoculars. Jupiter is close to opposition (9 May) and we show you how to identify its four main moons. 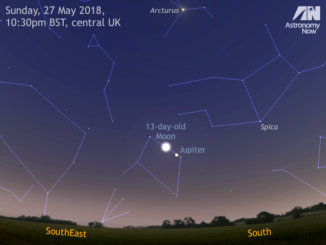 Jupiter, the solar system’s largest planet, is now visible low in the southeast three hours after darkness falls in the UK. 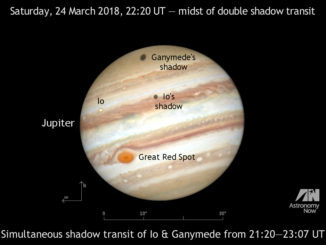 Now’s the time to dust off your telescope, check its optical alignment and hone your Jovian observing skills – particularly since a series of double shadow transits of the planet’s large Galilean moons starts on 24 March 2018. 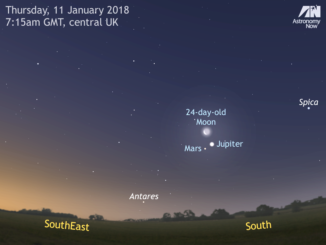 Three naked-eye planets – Mars, Jupiter and Saturn – grow in prominence in the dawn sky this month. If you wish to identify them for yourself, let the waning Moon be your celestial guide from 7–11 March. We also show you what to look for in binoculars and telescopes. 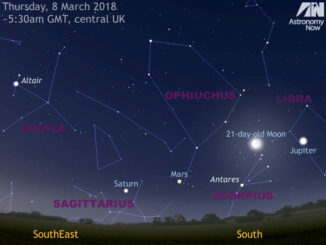 At the beginning of civil twilight on Monday, 13 November, observers in Western Europe and the British Isles should seek out a viewing location offering an unobstructed view very low to the southeast horizon to see brightest planet Venus and largest planet Jupiter separated by little more than half the width of a full Moon.